On the occasion of World Environment Day 2017, the Union Minister of Urban Development Shri M.Venkaiah Naidu launched a campaign on source segregation of municipal waste for National Capital Region (NCR). The Minister felicitated individuals, Residential Welfare Associations, Hotels and Restaurants who have commendably contributed to the source segregation of waste and also administered a pledge in this regard. Speaking on the occasion, Shri M.Venkaiah Naidu urged all citizens to participate in this campaign for its success. He said that bins with different colors shall be used to segregate waste where green bins shall be used for wet waste and blue bins for dry waste. Incorrect disposal and burning of solid waste results in carbon emission leading to climate change. Greenhouse gases like Methane and Carbon Dioxide are released as a result. 12.69 million tonnes of Carbon Dioxide in the country per year is emitted due to this, as highlighted by the Minister. Shri Venkaiah Naidu also highlighted a recent study which has revealed that 15 diseases, such as Hepatitis, Cholera and Malaria, are caused due to the improper solid waste management. Shri Naidu informed that a number of policy interventions have been introduced by the Government to encourage processing of municipal solid waste to compost and energy. He said that to promote conversion of ‘Waste to Energy’, purchase of electricity so generated has been made mandatory by DISCOMs and to promote ‘Waste to Compost’, a subsidy of Rs 1,500 per ton will be provided by the Government. During the occasion, the Minister released a special edition of Diamond Toons Comic titled ‘Chacha Chaudhary & Swachh Bharat’. The comic book depicts cartoons with a message pertaining to solid waste management. A Power Purchase Agreement was also exchanged between DMRC and IL&FS, in which the green power generated through waste by IL&FS plant will be purchased by DMRC. This green partnership between DMRC and IL&FS will greatly help in building a Swachh & Swasth Delhi. 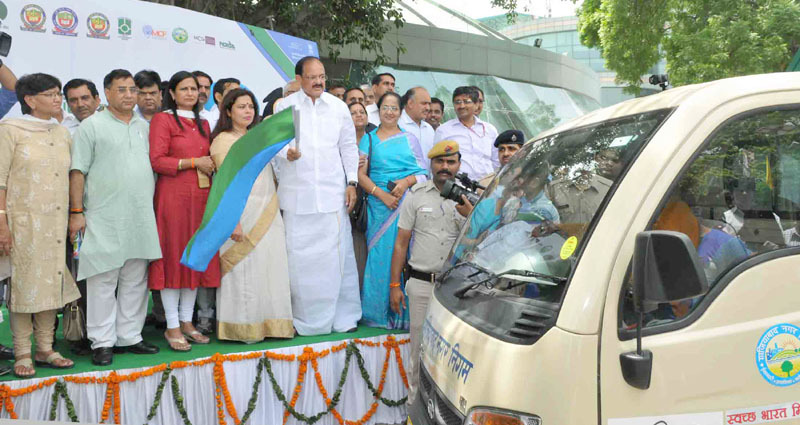 Shri M.Venkaiah Naidu flagged off segregated waste collection vehicles/ auto tippers, covering a total of nine Urban Local Bodies (ULBs), which include Gurugram, Faridabad, Noida and Ghaziabad, besides five ULBs of Delhi.